Providing you the best range of tube filling machine and vial sticker labeling machine with effective & timely delivery. Power Consumption 2.5 Kw. Max. ( If stirrer is attached 3.5 Kw. Max. Our Automatic Tube Filling Machine are manufactured from high grade quality material. Our range of machines have a label sensor and controller and various optional accessories like vacuum cleaning, jacketed hopper with stirrer, product level sensor in filling hopper with pump controller, automatic cassette loader to load the tubes and orientation sensors with stepper motor. Packaging Details: The Machine part contacting materials is made of 316 stainless steel, clean, sanitary and conforming to GMP for medicine manufacture. The machine is suitable for filling all kinds of pasty and high viscous fluid and the materials alike into large diameter plastic and composite tubes and then internally heating tubes, sealing and printing lot number and date. 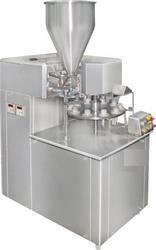 It is used in the industries of pharmaceutics, foodstuff, cosmetic and bond and so on. Our client can avail these machines at very reasonable price in market. We make available for our clients an array of Vial Sticker Labeling Machine or Automatic High Speed Rotary Ampule. 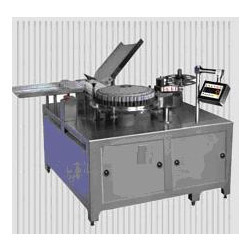 These machines are suitable for labeling on round vials, ampules, eye/ear drop bottles and other round objects. Our machines can be supplied with on-line coding system that matches with machine speed of the containers. Looking for Tube Filling Machine ?